My name is Sierra and I am a rising senior at Gann Academy in Waltham, MA. This summer I have been given the opportunity to intern with Combined Jewish Philanthropies (CJP) as a guest blogger. I wanted to work at CJP because of all the great work that they do in the Jewish community and, more specifically, their drive towards a more inclusive life for people with disabilities. Each week, I will share a post about inclusion for people with disabilities. My posts will include information about different programs, people, and ideas from all over the U.S. and Israel. I was first introduced to people with disabilities as a camper at Camp Ramah New England (CRNE). CRNE offers a unique program for children with disabilities to experience overnight camp through the Tikvah program. The Tikvah program provides children with disabilities the opportunity to make new friends, be away from home, and participate in a wide array of activities every day. Through the Tikvah program, I was encouraged to become a “Bogrim” buddy, essentially giving me the chance to interact with campers with special needs. The experience of playing sports, exercising, and just hanging out with the Tikvah campers was humbling and rewarding. I became so enamored with the campers with disabilities that last summer I volunteered as a CIT (counselor in training) in the Tikvah program and, throughout the school year, I volunteer at Gateways which provides me the opportunity to help children with disabilities learn, function in a classroom, be social, and connect with Judaism and the Hebrew language. Approaching my last summer as a camper, I wanted to do something special for the Tikvah campers who had so greatly affected my life. I decided to combine my passion for the Tikvah program with my passion for dance (I have been dancing at the Joanne Langione Dance Center in Newton, MA, for five years) and started working on a dance program for the Tikvah campers. Once Ramah approved my idea, I reached out to dance therapists in the Boston area to learn more about the benefits of therapeutic dancing and to find a therapist to run the program. Unfortunately, the dance therapist who agreed to run the program canceled at the last minute. When I returned home from camp last summer, I set straight to work and the dance program will be happening this summer at Ramah! 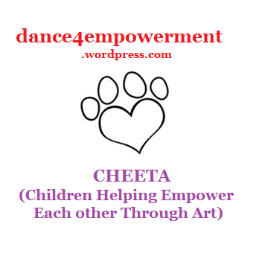 In addition, with the leadership skills I acquired as a Boston Diller Teen Fellow, I set the bar higher by starting a dance program for children with disabilities in the Boston area called CHEETA (Children Helping Empower Each other Through Art). My goal with this program is to help children with disabilities in the Greater Boston area improve their self-esteem and empower them through dance, music, and art. As part of my journey in understanding how to create an inclusive program for people with disabilities, I visited Israel during Gann’s exploration week—a week to “learn outside the classroom.” Although I was only in Israel for a week, I observed several successful programs and met many inspirational people. The connections I made in Israel along with the many leaders I have met locally continue to encourage and support me with the creation of CHEETA. I hope that over the course of the summer the people, programs, and ideas I share on the CJP blog will provide insight to the challenges people with disabilities often face and, hopefully, inspire communities to strive on becoming more inclusive.